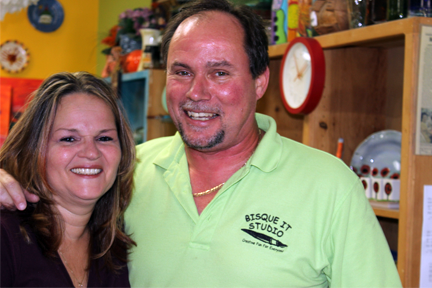 Bisque It Studio is family owned and operated by Hank and Liz Weisiger and is located in beautiful Port Charlotte, Florida. Bisque It Studio has been providing Charlotte County, North Port, Englewood, Port Charlotte & Punta Gorda a fun and safe place to express themselves creatively since 2006. Bisque It Studio is a full service creative working studio that welcomes all ages and abilities. You don’t need to be an artist to paint, do pottery or be creative. No appt is necessary to Paint Pottery, just walk in. Join us for one of our many creative outlets from: Pottery Painting | Canvas Painting | Glass Fusion and rest assured that you will leave the studio feeling like one! From Classes to Parties, we offer a creative fun outlet for everyone. We offer classes from Canvas Painting, Glass Fusion and Pottery for those who are looking to learn new techniques as well as increase their current knowledge base. You can stay current with our classes and schedule in our event Calendar. We also host Birthday Parties for all ages, Anniversary, Girls Night Out, Bridal and Baby Showers, Bachelorette, Engagement and Bridesmaids, Date Night, Book Club, Corporate, Office Parties, Team Building, or any other special event, celebration or request.